Downtown Downey Idaho April 2012. 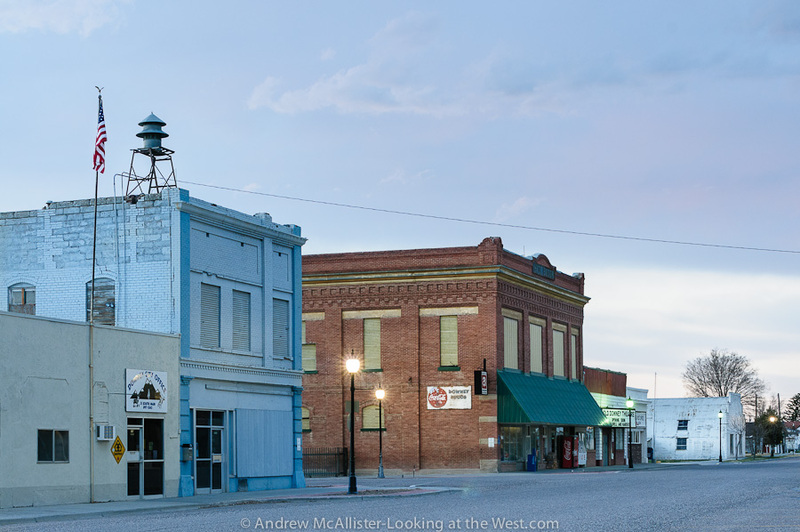 Two classic brick structures define the main intersection of this small farming town (population 613) in southern Idaho. Old Downey Theater sign says “opening soon Laurel and Hardies.” The two story structure is called Hyde Block and it houses the town’s market It features an ad for Mountaineer Overalls with Stop Loss pockets. The best image from the shoot includes a dilapidated two-story building, a grain elevator, a bar with a log cabin facade, and a variety of other single-story buildings. 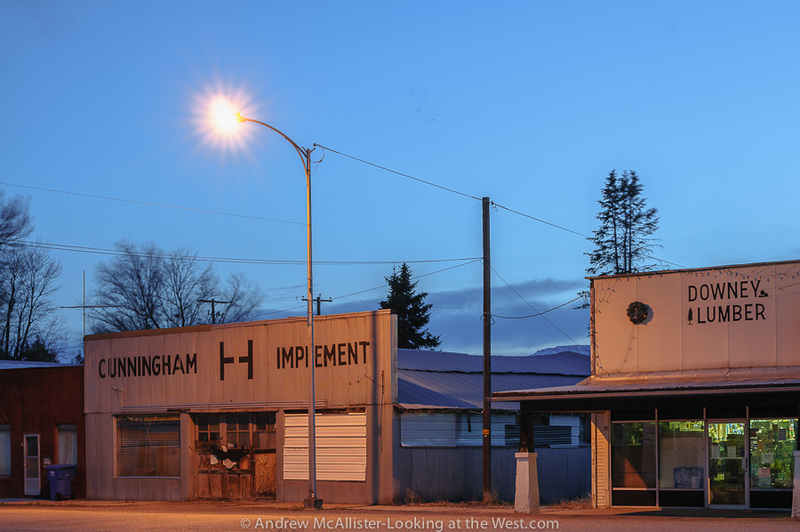 Cunningham Implement and Downey Lumber bathed in orange street light. I travelled in Utah, Arizona, Nevada and California 15 years ago. Discovering your blog with the great photos from countryside in Western USA makes me dream of these days – and of coming back again – soon! There is a lot to look at here in the west. Hope you make it back. Love the images, love the feeling of it and love the fact that you just made me want to get back in the hooptie and travel the country in search of some new and incredible images of our strange landscape called America. Keep up the great work! Thanks for looking and your comment. I really enjoy your blog. I hope you don’t mind but I have nominated you for the Sunshine Blog Award. Please see my recent post for details. Thanks for the nomination. I like and follow your work too! Second picture is beautiful. At first sight I have thought that the painted tree on the wall was the shade of the lamp-post. Very involving image. Amazing pictures! I love photos of small-town America, and these make me wish I could go there (I have a BIG thing for single story American shops too). Single story shops really help define a place and if kept up age really well. 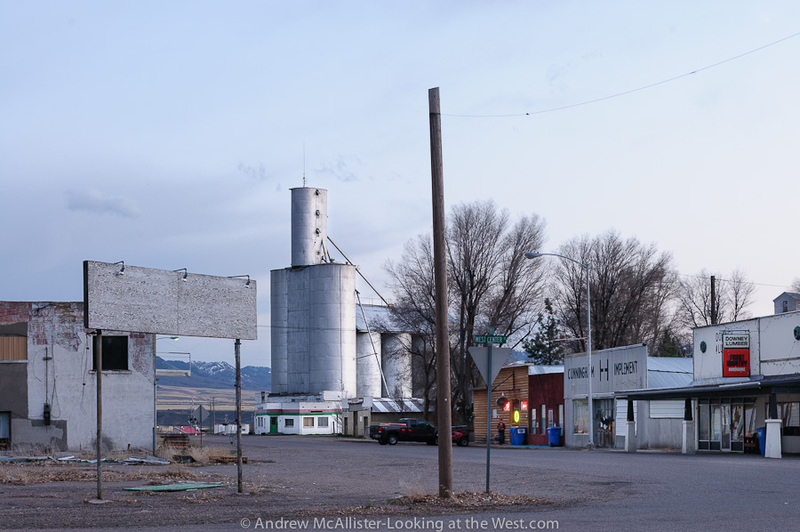 Keep checking back as I’ll be posting more shots of small western towns in the future. Thanks for commenting. Love this style of photography. love the soft colors and tones you get from some of those late day shots, nice job! Hi Andrew, I sure like your pictures. That mural on the side of the building is interesting. Have a wonderful Earth Day! I like the mural itself, how it has aged and it’s placement on this small commercial block. Thanks for your comment. Evocative images. You can almost smell the smell of the atmosphere framed. Wondferful photo’s-I agree with Ankur-you can almost smell it! I found you via the wordpress release-congrats on your wonderful blog! Great Photos. My husband and I love small towns with character like these. Over the years we have taken many shots while passing through on our travels. I’ll check your blog out. Do you post images of small towns? Occasionally. We have load on the hard drive of past trips that I have yet to post so you might find a few here and there. Is the downey theater for sale, or lease ? please e-mail me at driveinnow@aol.com thanks all.. I have no idea. I can check the next time I’m up that way, sometime in the next two months. These are beautiful pictures! I was born in and grew up in Downey :) Thank you so much for the trip down memory lane. My pleasure. Thanks for visiting Looking at the West. I’d like to get up there again this spring and photograph some more of the town and maybe a few residents. Anybody know someone who works at the grain elevator? The Downey theater is for sale.